Joe Chalmers is set to start for Caley Thistle at left-back. Joe HCaley Thistle will hand Joe Chalmers the task of filling the left back void created ahead of today’s Championship trip to Partick Thistle. Inverness have been left short in the position after Riccardo Calder was sacked having been found guilty of attacking a woman, while skipper Carl Tremarco remains sidelined with a thigh injury. Although Chalmers has predominantly played in midfield since joining the Highlanders in 2017, the 24-year-old previously played at left back with Celtic, Falkirk and Motherwell. Caley Jags boss John Robertson has revealed he could look to the free agent market for a replacement left back, but has also hinted he could hand an opportunity to teenager Cameron Harper in the coming weeks. Robertson said: “We have a solution at left-back – a guy who has played there many times in his career and is more than capable of stepping in. “The other aspect is it opens up a pathway for young Cameron Harper. He is a player we have high hopes for. Unfortunately for Cameron, he may be unavailable this weekend with a groin injury. That’s a decision we need to look at. Tremarco has been sidelined since suffering his injury in last month’s 0-0 draw at Alloa Athletic, with Inverness also without Shaun Rooney who suffered an ankle injury in last weekend’s 2-2 Highland derby draw with Ross County. Robertson added: “Carl has hurt his thigh. We look at him before the derby and he just wasn’t right. It will be two or three weeks minimum. 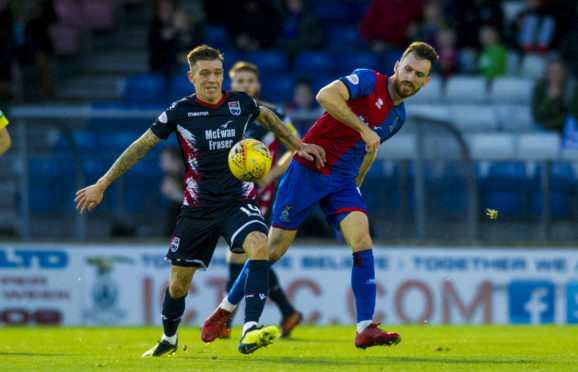 Caley Jags have set a club record of 23 matches unbeaten, but are aiming to end a run of seven consecutive draws when they travel to Firhill today. Robertson added: “Everyone is making a big issue about these seven draws, which is quite a unique run. But it isn’t like we’re going out to draw games. “The players try to win every game we play in. Last year we had a run of seven wins from eight in the league, great going, and this year they’ve turned into draws. “Last year, we talked about turning defeats into draws and draws into wins to get us to the title or promotion. What we’ve now got to do is turn these draws in to victories. That’s where we are.